Gentlemen prefer blondes, not blonds, especially not forms of the latter who are opposing point guards with lethal long-range shooting games and a bit of ’tude – like Shane Heal. “The Dream Team tried to bully us but we stood up for ourselves." Dream Teamer Charles Barkley certainly found out about Heal’s mongrel. Sir Charles, of course, is made of stern stuff and lived to tell the tale, but didn’t exactly go back for much more after pushing, shoving and sharing verbal pleasantries with “Hammer” at the Atlanta Olympics in 1996. The 182cm “shorty’s” dogged determination saw him through the most ferocious of encounters, whether in his rookie-of-the-year NBL season for the Brisbane Bullets in 1988, for the Geelong Supercats (remember them? ), the Sydney Kings, whom he captained to an NBL title in ’03, Greek pro outfit Makedonikos BC, the now-defunct South Dragons, Gold Coast Blaze, where he ended his playing days last summer, or even the Minnesota Timberwolves or San Antonio Spurs. We all have our favourite NBL stars from its heyday – James “The Alabama Slammer” Crawford, “Mr Magic” Steve Carfino, “Leapin” Leroy Loggins ... Who was yours growing up? Mine was Andrew Gaze – he’s five years my senior, dominated all the way through the junior ranks and went straight into the NBL. He did ultra well as an 18-year-old kid. For three of the four Olympics I played in, I ended up rooming with him. Now I commentate with him on Fox Sports! Obviously Andrew’s results in Australian basketball are Bradman-like – they’ll never be matched; statistically, anyway. He was certainly my idol in the NBL. Where did you get your “Hammer” nickname from? I got into a few scuffles when I was a bit younger and also enjoyed a bit of competitive boxing when I was growing up. I also played a lot of footy and, because of my attitude, I got into a bit of biff. All of a sudden they were calling me “Hammer” and it stuck. What’s the vibe you get from players, fans and sponsors in your travels concerning the health and future of the NBL? 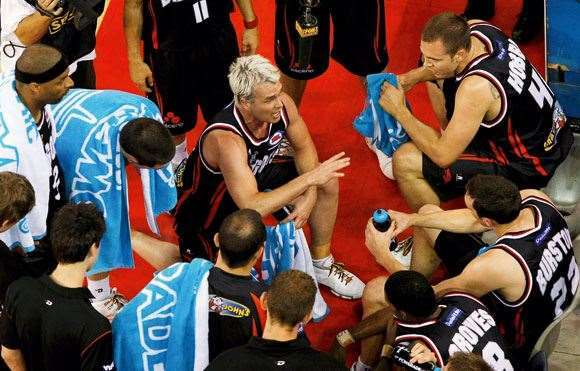 It’s no secret the NBL has fallen back a long way from its lofty days of the mid-90s. But I think people believe it’s hit the bottom and that there’s some positive signs the game is going to improve at the elite club level. It’s been tough with a few teams bowing out. I think it’s time the league got back to basics: enforce the salary cap, go out into the community – into the schools and the associations – and really try and create household names. All of which, thankfully, is starting to happen. The vibe will continue to improve and no doubt over the next five to ten years basketball will get back on the map. So it’s very much a case of the children are our future, then? star players visited our school we got to see the professionals up close and it was a fantastic opportunity. It only inspired you to go to a game or want to become like those players. I think that’s a really big part of getting the sport back to its glory days.